Access a variety of performance tools and functions to boost your productivity and provide unequaled service to your clients. 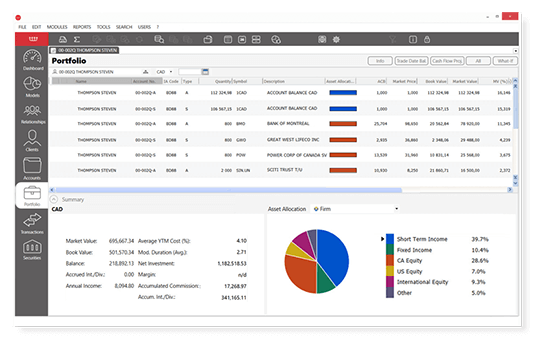 Our portfolio management software is designed to make advisors’ lives easier. Skilled advisors are committed to providing their clients with the very best. When it comes time to make critical decisions, Croesus Advisor is your trusted ally to ensure assets are carefully and strategically managed. 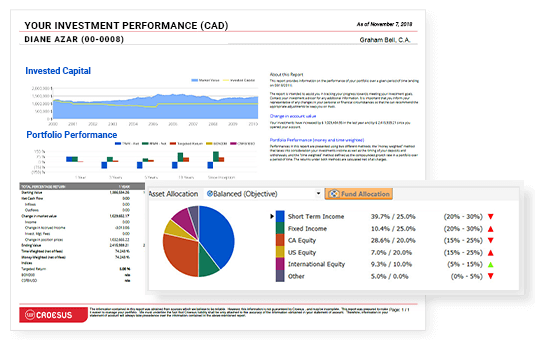 View your clients’ holdings, risk allocation, assets, and history with just a few clicks. 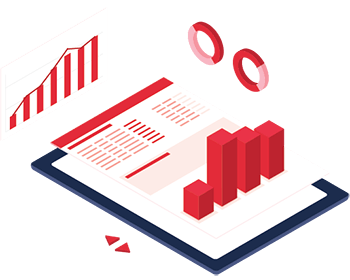 Track performance effortlessly and generate tailored reports to manage and prioritize your client interactions. Model portfolios to optimize performance based on reliable and pertinent data. Croesus helps advisors follow and adapt to different regulatory changes. View client portfolios and positions held by date, position data, projected income, mutual fund and exchange-traded fund (ETF) breakdowns, deviation from target asset weights, and security metrics. Get a leg up on the competition by designing custom portfolios for your clients and use a unified managed account (UMA) or separately managed account (SMA) strategy to build your models. You can also assign sleeves, accounts, clients, and relationships to your models as well as rebalance portfolios efficiently, and verify compliance before and after each operation with an integrated function. Buy, sell, or switch with block or individual trades. Trades can be sent directly to market or, as the case may be, to a trading desk for order management. Use money- or time-weighted return calculations, in compliance with GIPS® standards, to provide specific and consistent performance indicators. Risk indicators – like standard deviation, beta, and the Sharpe ratio – are available, as well as portfolio assessment metrics, like market yield, modified duration, and accrued income. Generate individual reports or report groups for clients or relationships. Users can define start and end dates and set their display and calculation preferences. 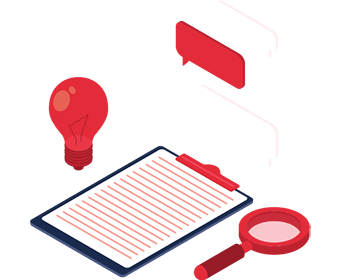 The look and feel of reports can be customized for your company. The integrated customer relationship management (CRM) functionality enables data, contact information, and key client preferences and know your client (KYC) data to be captured automatically or entered manually. Combine CRM and financial data, and take advantage of powerful data mining and information segmenting capabilities. 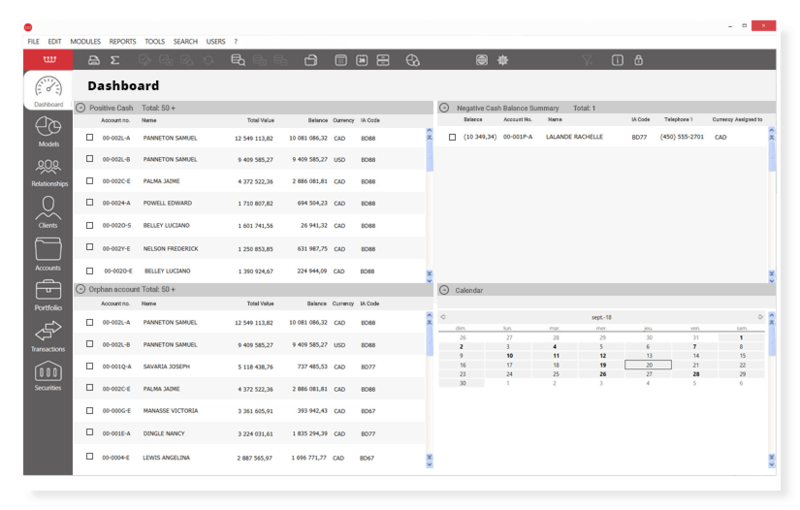 Generate personalized boards, queries, and alerts to monitor key business metrics, opportunities, and risks related to your clients and households. Manage billing and fees using customized pricing models. Pricing can be based on tiered or total assets, by category. Services can be billed over different time periods. Exclude unmanaged or unbillable securities and add special fees, as required. Securely and readily store and access your reports, client documents, spreadsheets, PDF files, emails, and notes. Our intuitive application enables you to access your client’s key data from a handheld device, anytime, anywhere. The ability to monitor investment growth is paramount for investors. 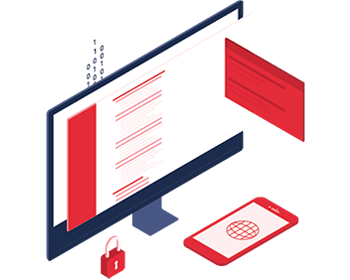 This secure online solution provides easy and safe access to accounts and portfolios for investors.